I ran into an issue this week when I attempted to format an 8 GB High Capacity SD Card inside of a camera and it failed to format. 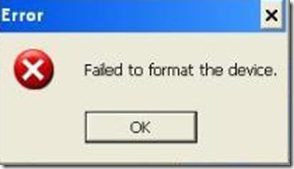 I then put the SD card in a pc and attempted the format only to have the format fail in the pc as well. This software formats all SD memory cards, SDHC memory cards and SDXC memory cards that comply with the SD File System Specification. 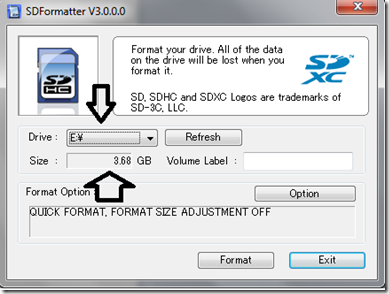 SD Formatter provides quick and easy access to your SD, SDHC and SDXC memory cards. The SD Formatter was created specifically for SD/SDHC/SDXC Cards. It is strongly recommended to use the SD Formatter instead of formatting utilities provided with operating systems which format various types of storage media. These generic utilities may result in less than optimal performance for SD/SDHC/SDXC Cards. 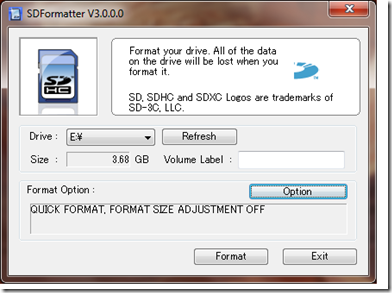 So I downloaded the program called SD Formatter 3 and tried it on ,my SD card and it worked. Once installed the application initialized with just one small screen. First, select the drive containing the card you wish to format. Likely, this will be E or F for most Windows users. Notice that when you select the drive, the size of the SD disk appears just below the selection. For the 4GB card used in this example, the size is recognized as 3.68 GB. (No Matter what size SD card you use, the size will report just a little bit smaller due to formatting requirements). Next, click Option to select how you want the SD card formatted. 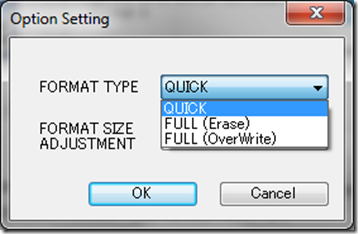 A dialogue box appears with a drop down menu listing three “format type” options. 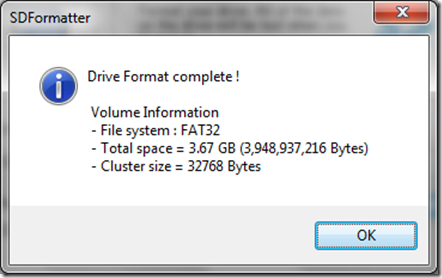 The second, Full (Erase), will put the disk into a proper SD format, be aware that even though this lists as Erase because it does a simple delete vs. overwrite, it may still be possible (It’s not easy but could be done) to recover the files that were on the drive. 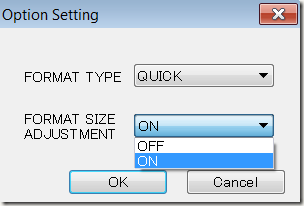 Under the Format Type drop down menu is a second menu called “format size adjustment” that asks if you want to try to increase the amount of space on your SD card or not. Turning this option on will allow you to use the maximum space possible on your SD card. Once you have made your selection, click OK. Finally after that you will be asked one last time if you are sure you want to do this. If you are sure, click OK.
With that you should now have a very usable SD card. This advice worked perfectly! Thanks so much. Thank you for being a person who actually KNOWS what they are talking about. Worked. What if I complete all those steps an overwrite format said its complete and successful, but there are still some files on the disc and the disc wont read in my camera? What kind of Camera (include model) are you trying to use with the SD Card?